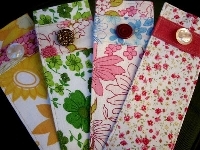 It's SUMMERTIME ~ so lets make our 1 partner a nice summery fabric book marker! Senders choice is size and fabric but use summery fabrics. Examples ~ bright colors, summer prints, or summer flowers, etc! Have fun! Happy Summer and always ~ Happy Reading! These are beautiful! I'm joining by the send-by date . . . just a note, though. It's listed as an electronic (Type 1) swap and should be listed as a Type 3. I fixed it to a type 3 swap!